Is your child interested in joining one of our children’s choirs? Is your child scared to try choir? Would you like your child to develop a love of choral singing? Does your child want to have fun learning new things and playing games? On Sunday, September 16, Children’s Ministry is offering a “Give Choir a Try” event in the Nazareth Room for all children in kindergarten through fifth grade. Children who have participated in choir previously before should attend. Those who have not, but would like to see what choir is like, should also attend. It will be a fun time – and no commitment to join the choir is expected. 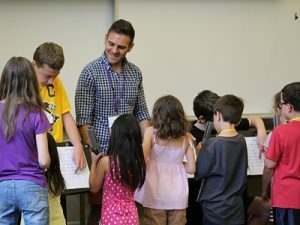 We would just like them to discover how fun music learning can be. Snacks will be provided. Questions? Please contact Stephen Donnelly through the church office. Consider inviting friends, even if they are not church members. Our children’s choirs are open to all! Children will leave the Sanctuary for Chapel Worship, then will move to the Nazareth Room with Stephen Donnelly for a time of games, singing, and snacks. After the conclusion of worship, children will leave the Sanctuary and go to the Nazareth Room to meet Stephen Donnelly and will participate in a time of games, singing, and snacks.